Periodontal disease – commonly known as gum disease – is a widespread health problem estimated to affect up to half of the adult population. The disease destroys the healthy gum attachment to the roots of the teeth, leading to gum infection, gum recession, bone loss around the teeth and halitosis (bad breath). If untreated it will lead to tooth loosening, drifting and tooth loss. These slides & panoramic x-rays show the difference between a healthy patient (left) and one with advanced periodontal disease (right).You can see the gum recession and open ‘holes’ between the teeth as well as the huge amount of bone loss around the roots of the teeth. Advanced periodontal disease often leads to the loss of many teeth and leaves sufferers with severely compromised function and aesthetics, as well as affecting their general health and quality of life. 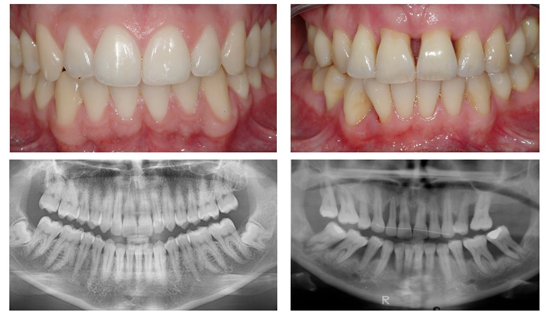 Take a look through our case studies or call us to understand more about our treatments for gum disease that could be life-changing for you too! Take a look through our case studies or call us to understand more about our treatments for missing teeth that could be life-changing for you too! “After a bad experience as a child and slowly losing my teeth through 30 years of neglect, I knew that I needed a dentist and someone special! I was particularly interested in implants as I did not fancy dentures. Dental implants could, in effect, give me my third set of teeth! To get to know more I went along to an ‘informal open evening’ to look around the practice and meet the staff who are all very friendly and put you at ease about your fears. I then saw a slide presentation by Dr Mankoo demonstrating the different types of treatments carried out at the practice which was very impressive. Our expert treatment in Dental Implant & Aesthetic Dentistry is proven and well regarded, read our case studies here.